In our June meeting Janet Robinson will be showing us how to make this beautiful little Keepsake Book. You will need to bring: 12 x 12 paper, A4 plain paper, Heavy Card – enough to make two 5 x 5 inch squares, 12 inches of ribbon, Black Ink Pad and Stickles plus your large scoreboard, scissors, glue, etc. Janet will bring backup materials in case you haven’t got everything on the list. Janet will also show you how to use embellishment mousse which is like metal embellishing wax but comes in beautiful pastel colours. It cane rubbed onto embossed card, watered down and used either as paint or to spritz onto card. If you want to try this technique please bring some plain embossed card – also some blending ink, Card blanks, extra card and Baby wipes! In our next meeting on Monday 20th March 2017, we will be making Pop Up Cards. We will be making two cards and the equipment you will need to bring is – a ruler (a transparent one would make life easier! ), pencil, scissors or craft knife, bone folder, paper trimmer and glue. 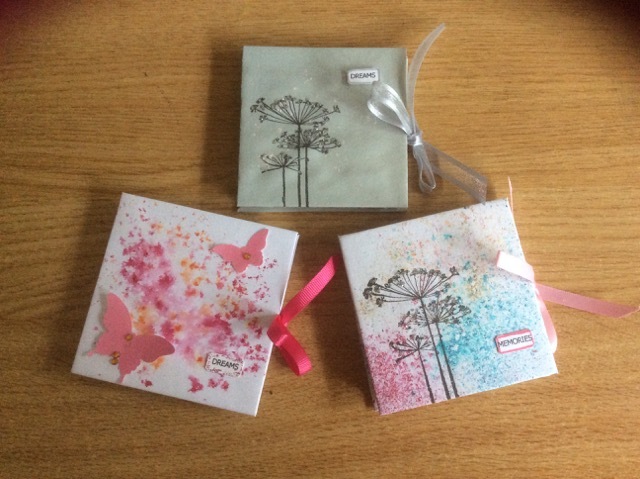 And for two cards you will need the following materials: 2 Card Blanks – one Portrait & one 6” square, Card or heavy weight paper – it must fold easily – any colour will do but it needs to be the same size or slightly smaller than your card blanks. You will also need an assortment of patterned and plain paper/card for decorating your cards plus die cuts or stamped images and greetings to embellish. I also strongly recommend that you bring some scrap paper to practise on because you might make some mistakes if you don’t concentrate and I don’t want to have to send anyone to the naughty corner! In February’s meeting we will making those oh so difficult, or should I say, awkward Cards for Men. We will be making two different styles of cards and you will need to bring two sheets of A4 card, a sheet of acetate and suitable patterned paper plus string or twine. We will be doing some die cutting and stamping so I will bring my Cuttlebug and dies but if anyone has another machine and some star shaped nesting dies then it would be helpful to bring them along. You could also bring some small star stamps and inks that coordinate with your patterned papers. As I will be on holiday for this month’s meeting then unfortunately the samples won’t be available! See you all on 20th February, 2017. 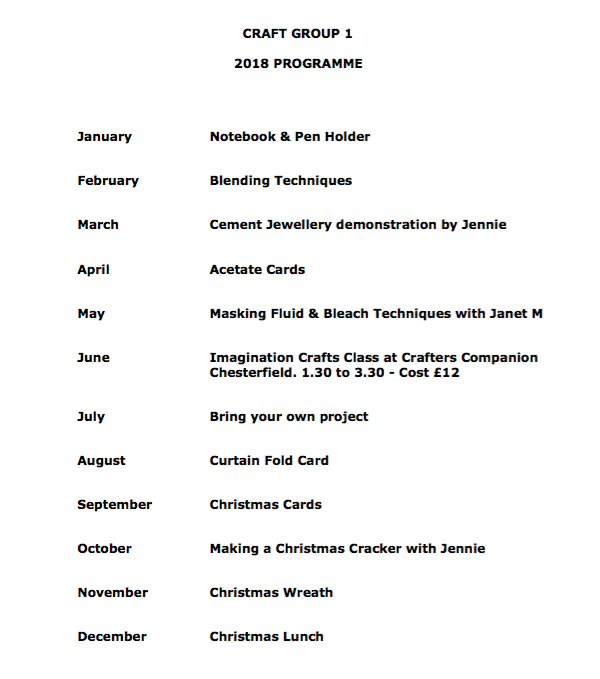 At our meeting on 21 November, Janet Robinson will be showing us how to make a beautiful gift tag for a special gift. You will need to bring your scoreboard, 1/2” Circle Punch, glue and glitter. Also if you have any of the following, please bring these as well although Janet can supply them if you haven’t got them in your stash. Card with a small Christmas pattern – it needs to be a heavier weight than paper, Bakers Twine, Small Bells, Christmas wooden buttons, Co-ordinating ink pads and Wooden embellishments or toppers.